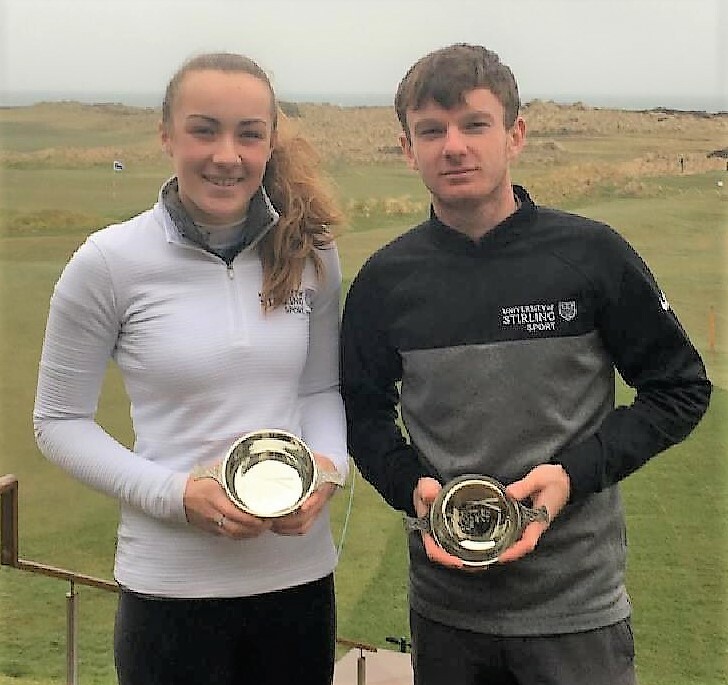 Scotland's Hazel MacGarvie and England's Laird Shepherd, both from Stirling University, secured dominating victories today (Wed) at a windswept and wet Western Gailes links in the BUCS West of Scotland Trophy students' tournament over 54 holes. MacGarvie, a former Scottish U18 girls champion from Troon and a first year student at Stirling, had a commanding six-shot lead going into the final round. She shot 77, equalling the best women's score in the difficult, including two birdies to claim a 10-stroke victory with a total of seven-over-par 220 (+7). It was an impressive first Student Tour victory for MacGarvie against a strong field. In second place was Kirsten Brown from St Andrews University. She also signed off with a 77, thanks to a birdie at the last hole, to hold off the Irish challenge of Meadhbh Doyle from Maynooth University in Ireland. Doyle also finished with a 77. A CSS of 76 (reduction only) on the par 71 course shows how difficult the final-round conditions were. In the women's team event, Stirling 1’s line-up, consisting of MacGarvie, Gemma Batty and Chloe Goadby, won by 12 shots from runners-up Maynooth. Laird Shepherd, who is the reigning Scottish Universities champion, led going into the final round by only one stroke shot but increased his lead over the field with a fine one-under-par front nine, which included birdies at the first, fourth and seventh. The Englishman then came home in 37 for another 72, one over par and the lowest round of the day. Shepherd’s total of three-over 216 was 9 shots better than his closest rivals. Jordan Sundborg from Stirling rocketed up the field with a closing 73, which for a long time was the best score in the clubhouse. Sundborg beat Monty Scowsill from Exeter University, who also had a 225 total, on a countback for second place. Paul Lawrie's younger son Michael, a student at Stirling, had the honour of being the highest placed Scottish-born finisher in joint fourth place on 226 with rounds of 73, 75 and 78. In the men's team event, Stirling 2’s squad achieved a five-stroke shot from runners-up St Andrews 1 to secure a clean sweep of the titles for Stirling - a show of strength from Stirling ahead of the defence of their Scottish students' match-play title next week at Moray Golf Club, Lossiemouth. Shepherd will be defending the men's title and Gemma Batty goes in search of a fourth straight women's championship in the event. 226 D Lloyd (C Lancs) 75 75 76, M Lawrie (Stirling) 73 75 78. 228 J McVicker (Ulster) 74 77 77, M Napier (Stirling) 74 76 78, E Ferguson (UHI) 73 76 79, A Benson (Strathclyde) 74 74 80. 220 H MacGarvie (Stirling) 69 74 77. 249 F Clark (St Andrews) 77 78 94.